Super Eagles' Technical Adviser, Gernot Rohr has invited stand-in captain Ahmed Musa and 22 other players for this month's Africa Cup of Nations qualifier against the Pirates of Seychelles and the friendly against Egypt's Pharaohs, both taking place in Asaba, Delta State. In-form CD Leganes of Spain defender Kenneth Omeruo is called alongside usual suspects Leon Balogun, Abdullahi Shehu and William Ekong, as well as midfielders Oghenekaro Etebo and Wilfred Ndidi and forwards Odion Ighalo, Alex Iwobi and Moses Simon. Rohr has also named Flying Eagles' defender Valentine Ozornwafor, as well as well as former U-17 World Cup winner, Victor Osimhen and Denmark-based Paul Onuachu. 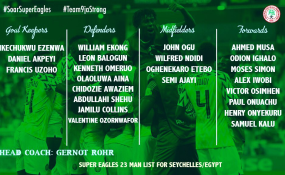 The three-time African champions confront Seychelles in a largely-ceremonial session at the Stephen Keshi Stadium on Friday, 22nd March, starting from 4pm, and then tackle the Pharaohs of Egypt at the same venue in a prestige international friendly four days later. All invited players, alongside technical and backroom crew, are to report in the Delta State capital on Monday, 18th March 2019. Defenders: Olaoluwa Aina (Torino FC, Italy); Abdullahi Shehu (Bursaspor FC, Turkey); Valentine Ozornwafor (Enyimba FC); Chidozie Awaziem (Caykur Rizespor, Turkey); William Ekong (Udinese FC, Italy); Leon Balogun (Brighton & Hove Albion, England); Kenneth Omeruo (CD Leganes, Spain); Jamilu Collins (SC Padeborn 07, Germany). Midfielders: Semi Ajayi (Rotherham United, England); Wilfred Ndidi (Leicester City, England); Oghenekaro Etebo (Stoke City FC, England); John Ogu (Hapoel Be'er Sheva, Israel).